Isn’t it so surreal that there’s a Batman and Teenage Mutant Ninja Turtles crossover? 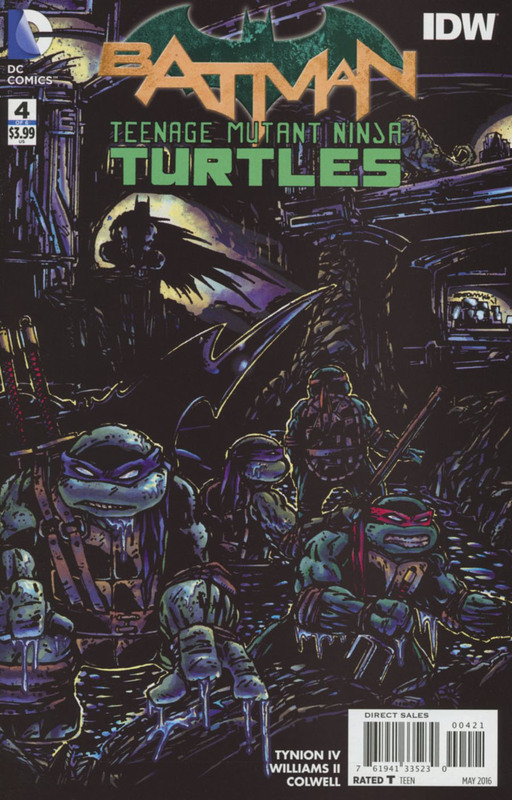 I mean, this is something that so many of us have wanted to see for decades, but considering the Dark Knight is with DC Comics and the Heroes in a Half Shell are with IDW Publishing, it just didn’t seem probable. But here we are, reading a limited series that has Splinter and his four mutant sons trapped in Gotham City… with Shredder, too! For many of us, this is a dream come true. Please forgive that cliche idiom, but it really is! I don’t know about you, but back when I was growing up, Batman and the TMNT were the two franchises I was the most passionate about (sorry, Ghostbusters and Spider-Man); my mom even made me Halloween costumes based on both franchises. Now, these two incredibly popular sides are finally meeting, and luckily for us, it’s obviously a passion project for the creative team, not a blatant cash grab. Writer James Tynion IV, artist Freddie E. Williams II, and colorist Jeremy Colwell are creating a limited series that gives both franchises a whole lot of love, and, so far, every single chapter is pure fan service. Yes, that praise includes this Wednesday’s fourth issue, too! In the first encounter between the Caped Crusader and the mutated dudes, things didn’t go so well for Leonardo and his brothers. Well, without spoiling anything, I’ll just say there is another action sequence in Batman/Teenage Mutant Ninja Turtles #4, and I think it’s one that’ll leave both sides feeling satisfied. 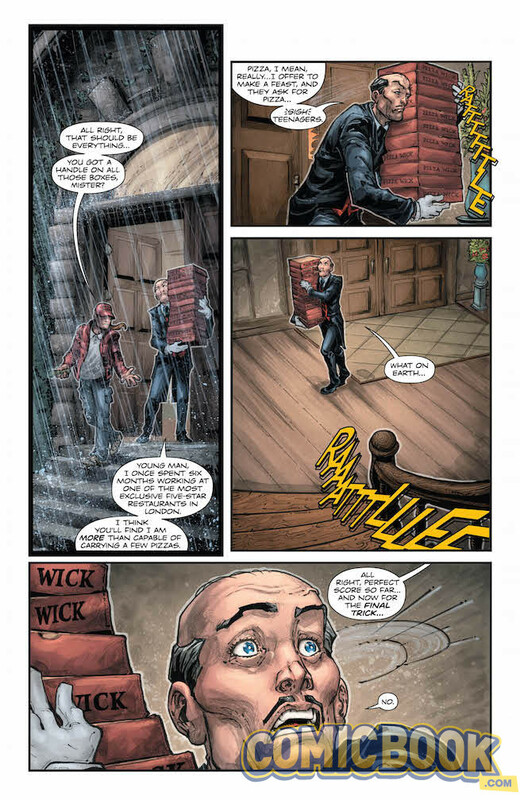 It doesn’t hurt that Williams II did a great job with the choreography, and Colwell fills the panels with eye-catching colors. If you’ve looked at Williams II’s cover, you may be sarcastically thinking something along the lines of, “Oh great, another issue about the death of Batman’s parents!” Look, I completely get it. How many times can we effectively revisit that tragedy in Bruce’s life? While the reason for the discussion is pretty predictable, I’d say Tynion justified bringing the topic up. Oh, and don’t worry, it doesn’t play a big role in the issue, but it does play a momentarily important one. It probably won’t get your tears flowing, but I think it’s properly included instead of feeling forced. When the story isn’t focused on the more evil side of things, we’re getting some fun dynamics between the heroes. Alfred has an amusing interaction with Mikey, and Donatello is acting exactly how you’d expect him to when he’s surrounded by such impressive technology. The focus on Raphael produces such a captivating panel with the grumpy guy. Seriously, I couldn’t stop staring at it; it just pulls you right into the moment. Now that they’ve moved past the let’s-fight-because-we-don’t-know-each-other stage, it’s time to watch how they all connect. It’s crystal clear that Tynion’s having a good time exploring that part of the series, and thankfully, I’m having a good time reading it. The fourth chapter of Batman/TMNT is good fun. It’s focused on building the plot and giving a little more insight into some characters, but it’s also full of entertaining dialogue, includes two enjoyable action scenes, and there’s consistently awesome, attention-grabbing artwork. If you’ve also been loving this series, the final page is pretty much guaranteed to make you want the fifth issue right away. Seriously, DC, we’re totally cool with reading it right now. Pretty please? But seriously, Batman and TMNT fans, make sure you pick this comic up, and then prepare to let your inner-child take over.